Lee Greenwood is changing the way Dewsbury Rams approach matches and wants his squad to up their levels of intensity during training sessions. 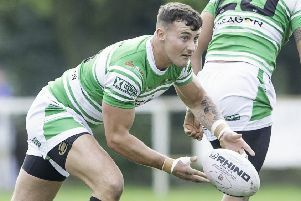 The St Helens amateurs are the lowest ranked side left in the competition but they already have a professional scalp to their name having beaten North Wales Crusaders in the last round. The tie has been selected to be streamed live by the BBC Sport website and Dewsbury will be determined to produce a professional display to ensure they are in the hat for Monday’s sixth round draw. The Rams slipped to a 20-12 defeat away to Bradford Bulls in the Betfred Championship last week and coach Lee Greenwood will look for an improvement at the start of what is a hectic period. Speaking after the Bulls defeat, Greenwood said: “I am changing things here at the club, we train properly and we are changing how we want the team to play. It probably has been a culture shock to a large number of people who were either at the club previously or have come from other clubs. We want to train at an intensity that you would play to in a game.